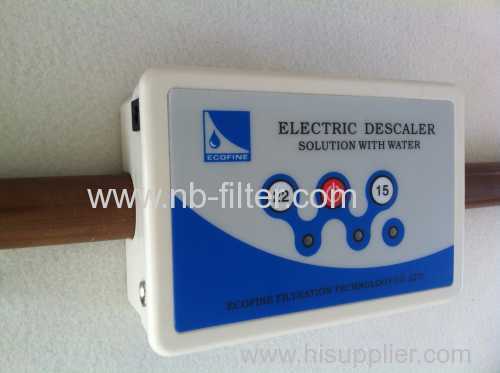 The electronic descaler can thinning water cluster into water molecules through externally imposing equal signal with valence bond oscillation frequency, increasing substantially the dissolution degree of encrustation ion imposed by water in order to come to the goals to descale, prevent scale and remove rust. Meanwhile, inert oxygen produced by complex magnetic field cuts off the resource of oxygen which is needed by rust and then come to the goal to anti-corrode. Moreover, the water turbulence caused by complex magnetic field destroys ion passage of cell membrane, changes the favorable existence environment and at the same time, a large amount of water molecules released under the effect of magnetic will blockade oxygen dissolved in water, cut off oxygen resource and reach the goal to sterilize, remove algae and proof sludge. Installation of water pipes is fully activated for hot water system. Make it to remove the original scale and keep it clean. 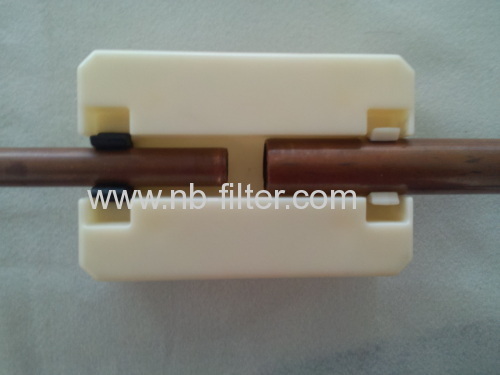 Improve the heat exchange efficiency, extend equipment life and improve water production. 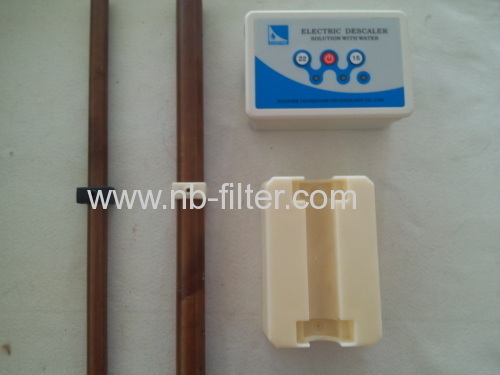 Water receiving special frequency and magnetic field has good rust and corrosion inhibition. For the poor quality of water or salt water areas, protect equipment from corrosion and rust or slow role. Special frequency and magnetic field can kill bacterial spores and algae in water. 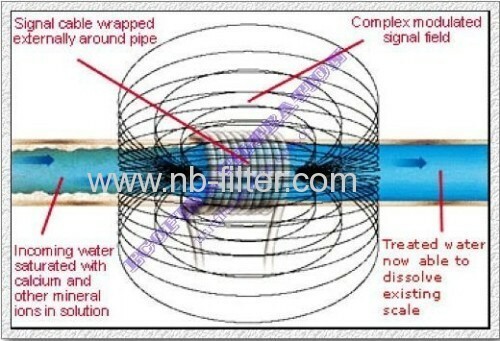 Special frequency and magnetic field on water pipes makes the water into the depth of magnetized. So that the macromolecules of water become less than six rings of small molecules of water. Long-term drinking will have a very beneficial health. 1. Pipes. Original encrustation attached inside pipes has gradually lessened, softened and dropped off. 2. Boilers. Sight glasses that have been encrusted gradually become clear; encrustation inside boiler and pipes flows out with water. Afterwards, the system can remain in a state of cleaness and boilers of all kinds can save 5%-8% energy per year (excluding free dosing and manual descaling fees). 3. Air conditioner system. 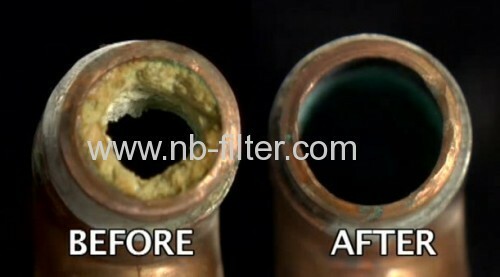 Pipes keep smooth, pump pressure lowered substantially. 4. Tea boiler and heater etc. Encrustation outside sprayer and valve drops off and heating time shortened. 5.The heating circulation system. The resistant force of system is reduced obviously, heat circulation efficiency being increased. 6.Heat exchanger. 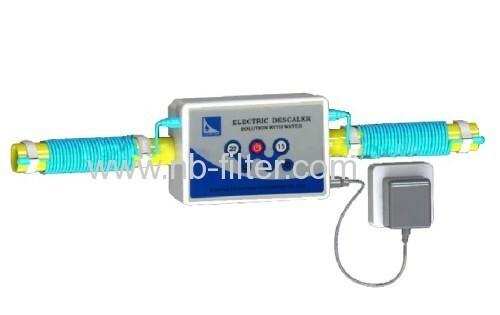 The device can keep inlet and outlet water temperature constant, alleviating corrosion degree of pipes and extending life span of heat exchanger. 7.Humidifier. Inside device, there is no firing phenomenon and no fault, which extend life expectancy of humidifier.